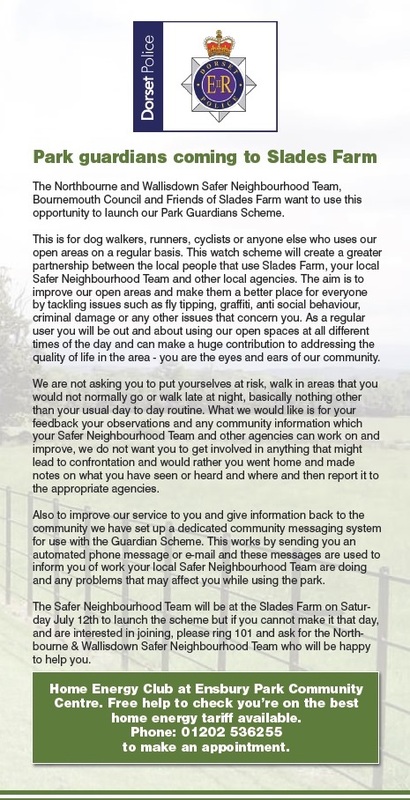 Slades Farm Open Space currently sits on land previously known as Talbot Village. 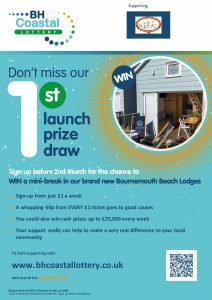 The Talbot Village was built between 1850-1862 by the Talbot Sisters, Georgina and Mary, to help employ and look after the poor of Bournemouth. 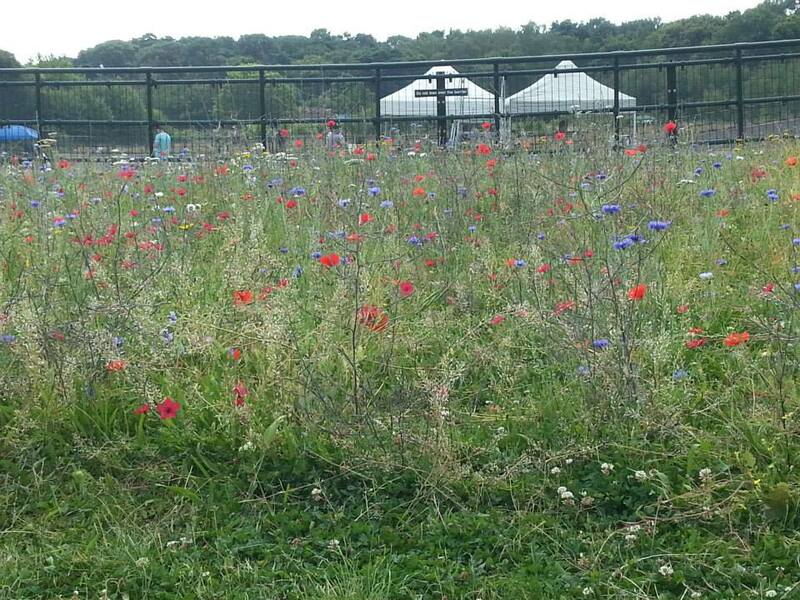 This consisted of cottages and plots to farm along with alms houses for the elderly/ widowed. A school was built in 1862. Initially, this land consisted of 19 dwellings and in addition to the cottages the village had 6 farms, each covering 20 acres to create employment and trade for the village. Three farm buildings survive today, Highmoor Farm (still operational), White Farm serving as stables in the 20th century, but is now residential as is Lollipop Farm (on Columbia Road). Both of these farmhouses can be seen to this day unlike the farmhouse at Slades which, although being Grade II listed, was approved for demolition in 1977 after falling into disrepair after many years of non-occupation. 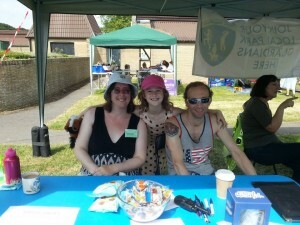 Many people report attending fun fairs at Slades Farm between the 1940s and 1960s. 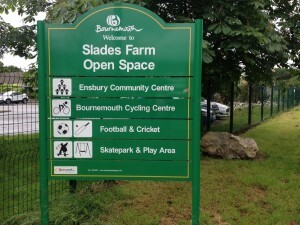 Slades Farm survives in name only having been developed as Housing Estate and Open Space in the 1970’s. 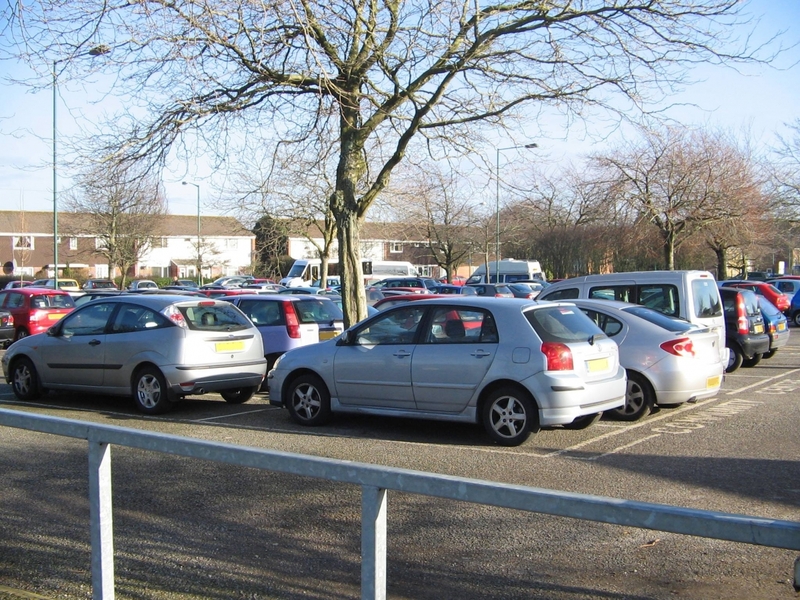 Slades Farm Housing Estate was built in the 1970s on land purchased by the Council from the Talbot Village Trust. The Housing Estate consisted of some 400 homes and a school. 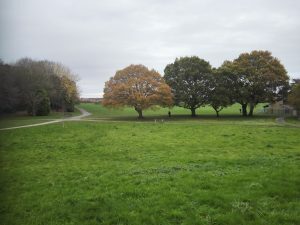 Currently, Talbot Village has 11 acres of woodland. 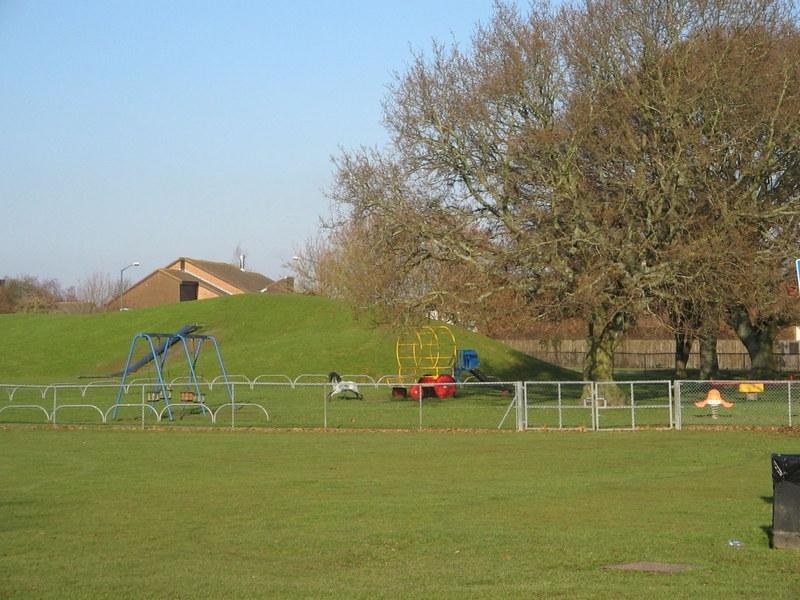 In January 1973 it was first proposed to develop Slades Farm open space and works were undertaken in 1974-76. This was planned to integrate with the new housing development and included car parking facilities. 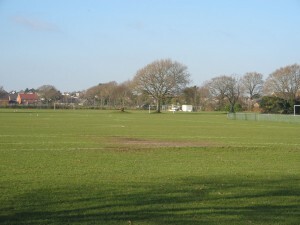 In 1976 a report went to the Council stating that the playing fields would be ready for use by winter and proposed a number of buildings on the site. 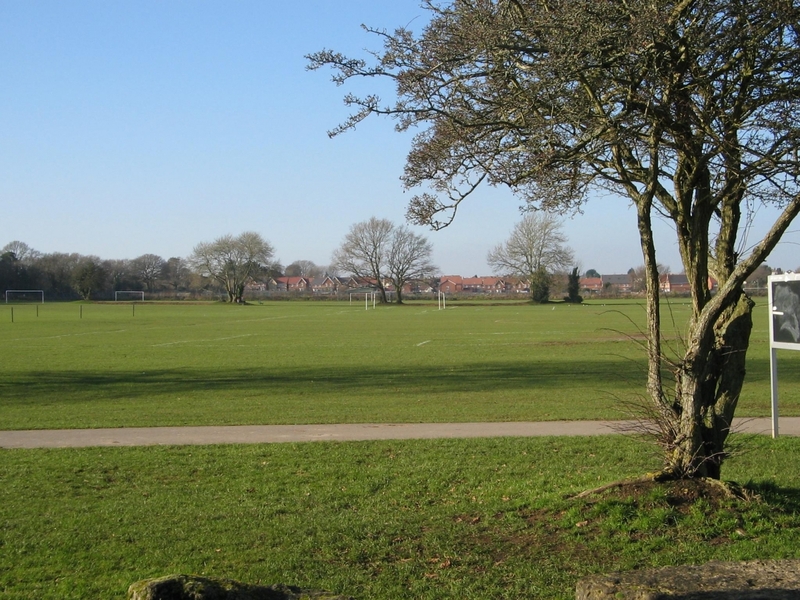 These included changing rooms to replace the existing wooden buildings at the Talbot Rise playing fields. It was planned that the new buildings be kept within one area in an integrated layout ‘to retain the overall balance of the complex’. 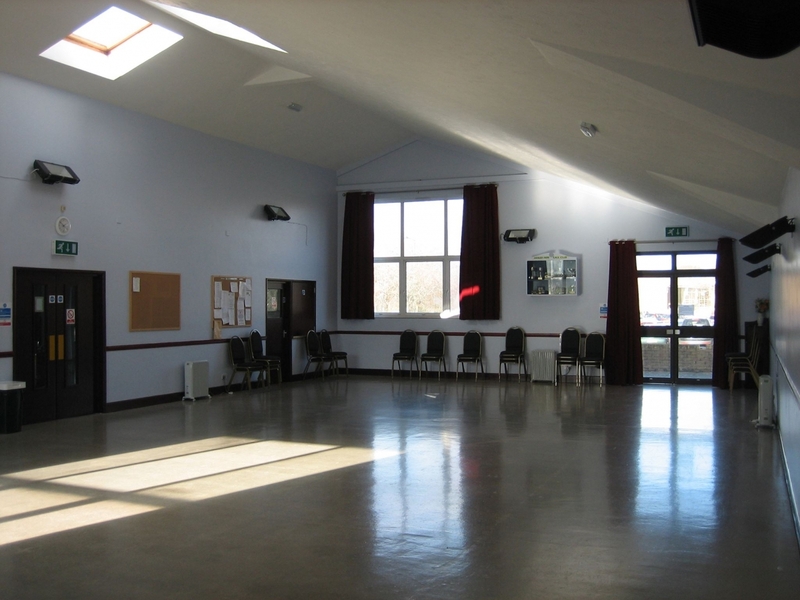 The buildings consisted of 1) Team Changing rooms, Pavilion, Office, Public Toilets, Boiler Room. 2) Six further changing rooms. 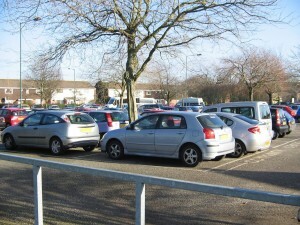 3) A Parks Depot. 4) Community Facilities. Construction was undertaken 1977-78 at a cost of £104,500.00. 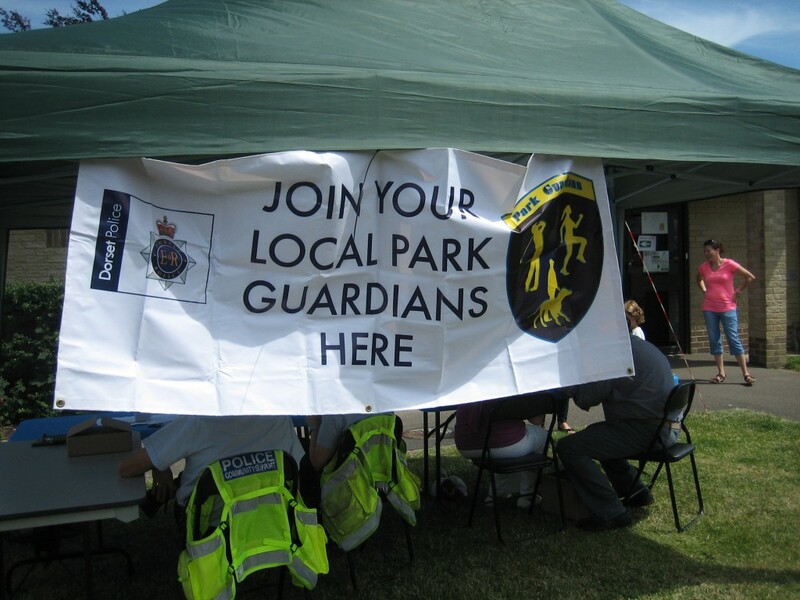 The tradition of holding events on the site seems to have fallen away by the 1970’s, with the exception of a May Day Festival which was held on this site in 1979 which was reportedly a major event in the community. 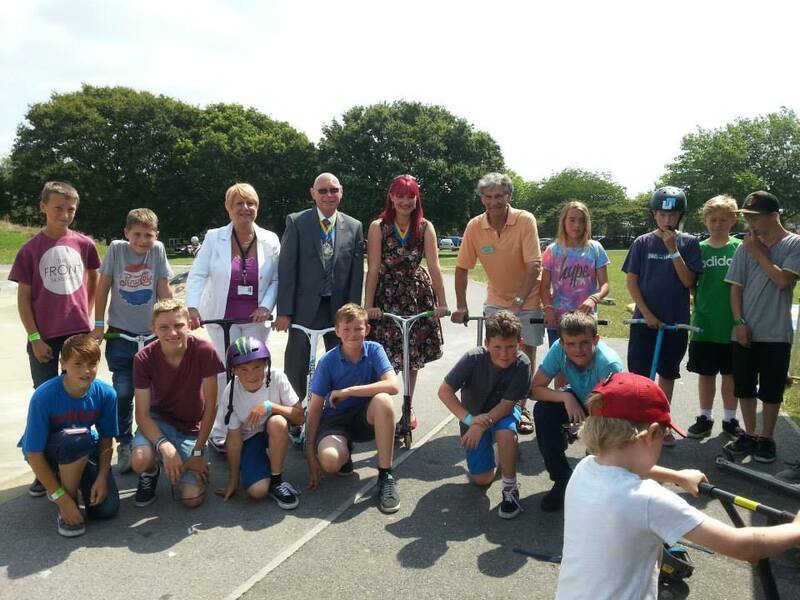 Records show that in 1982, the annual tradition of Fun Fairs on the site that dated back to the 1940s was resurrected at the fee of £70 per day for the operator. 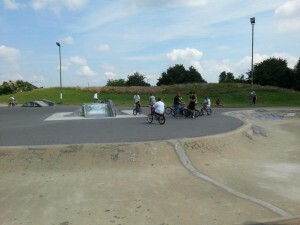 Skate Park; After investigating the provision of nursery skateboarding slopes as part of the children’s’ play development it was decided to go ahead and in February 1978 construction contracts were awarded to Hampshire Skateboard Centre at the cost of £8,000.00.The Skateboard Park opened in June 1978. 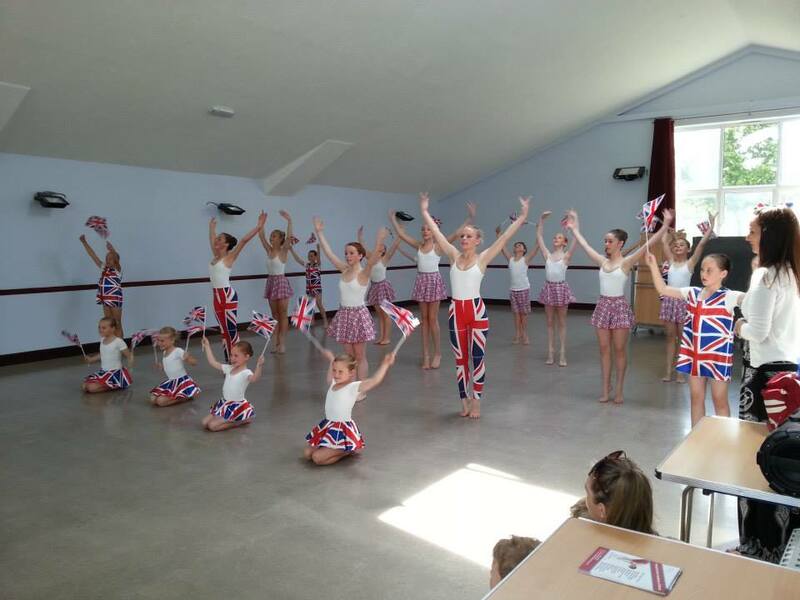 It was initially planned to have an attendant to run the facility but this idea was later dropped. 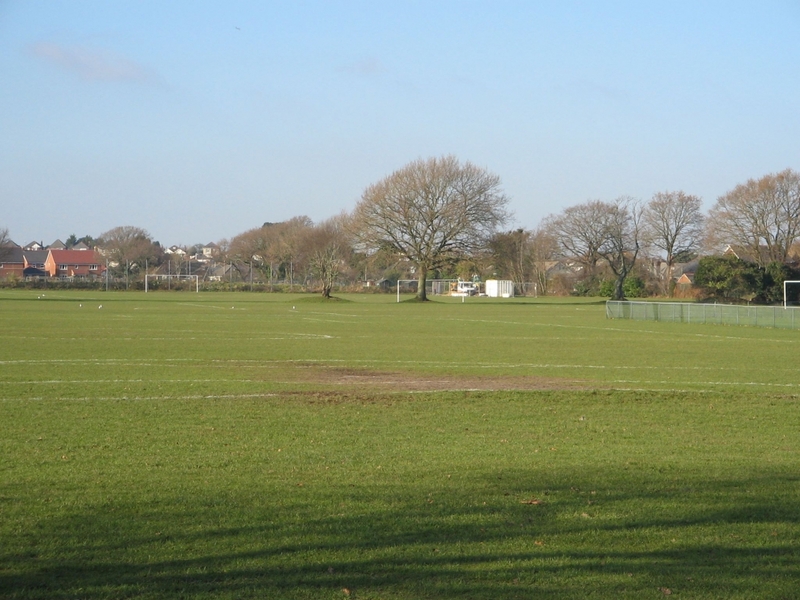 All Weather pitches; After being approached by Bournemouth Football Association with a grant from the FA and additional monies form Bournemouth Borough Council a floodlit, all-weather football area was built. 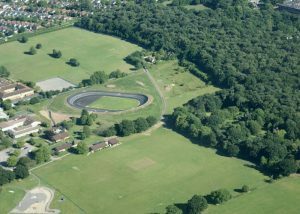 Later, this was also marked out and used for Tennis as well, though this was later demolished and removed in the 1990s. 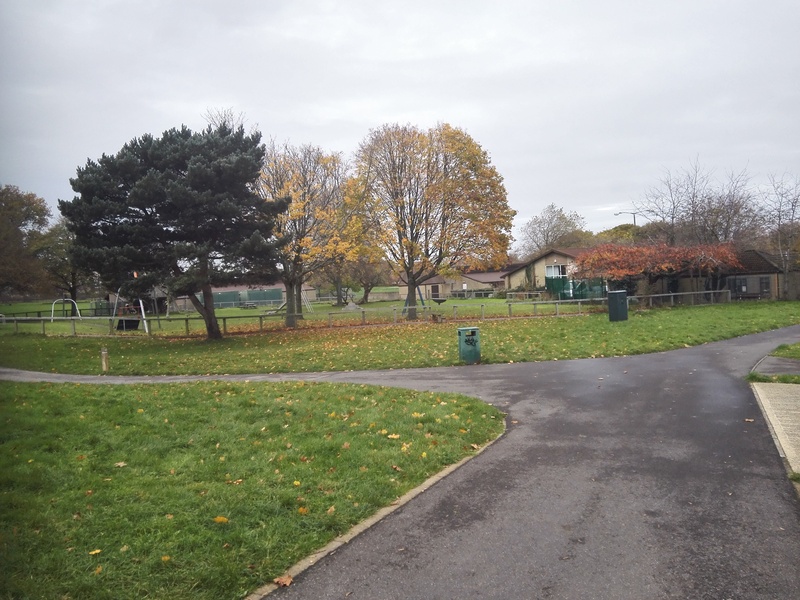 Mulberry Tree; Reports go back to the 1940s of the Mulberry Tree located at the rear of the changing rooms being a favourite area for local children to play. 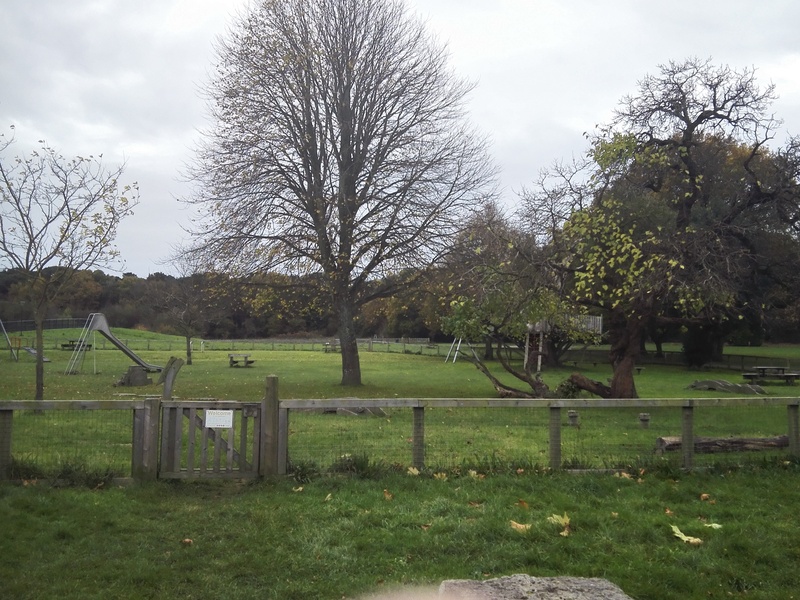 In present day, the tree remains a central part of the children’s play area. By July 1989, Slades Farm boasted facilities including 7 Football Pitches, 3 Cricket Squares, a Skateboard Park, All-weather floodlit Football pitches/ Tennis courts, 2 play areas (one by the Skateboard Park and the other by the rear of the Pavilions), a grass running track, 2 sports Pavilions / changing rooms, a Parks Depot and a sizeable car park. 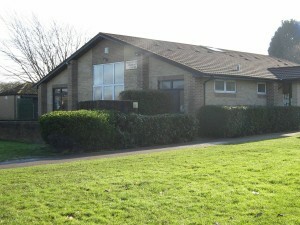 In the 1990’s the Ensbury Community Centre was built between the Parks Depot and the Changing Rooms. 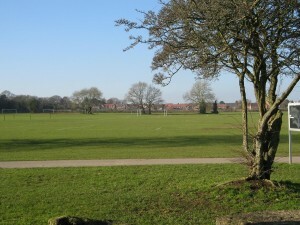 In 2012 the fenced dog park was built at a cost of £25,000.00. 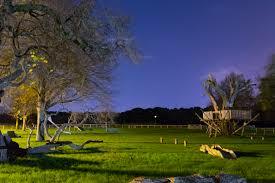 This area consists of seating areas for owners and a range of agility equipment for dogs for both fun and training. 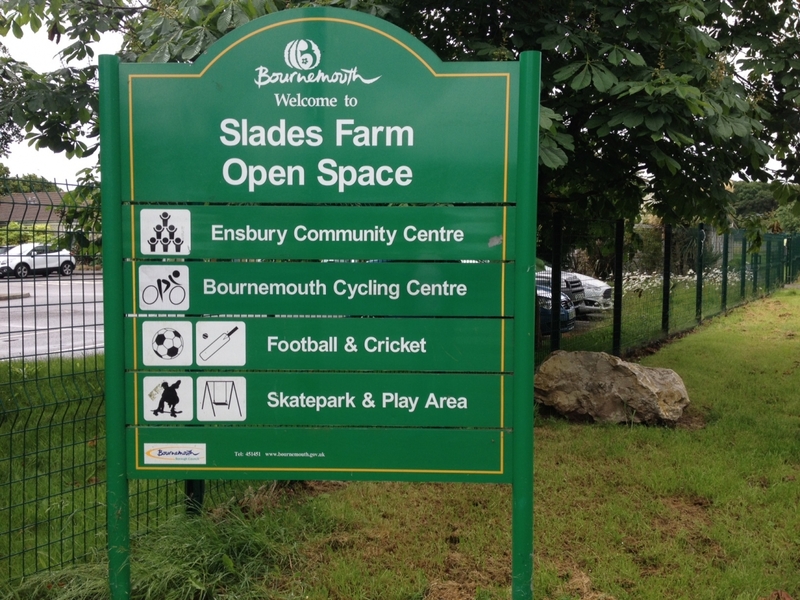 In May 2007, a private company surveyed around 700 users and residents about Slades Farm’s current use, priorities for works and Future Developments. From this and the detailed Space Shaper survey also done in this year, the Slades Farm Master Plan was developed to outline the desired future for Slades Farm. 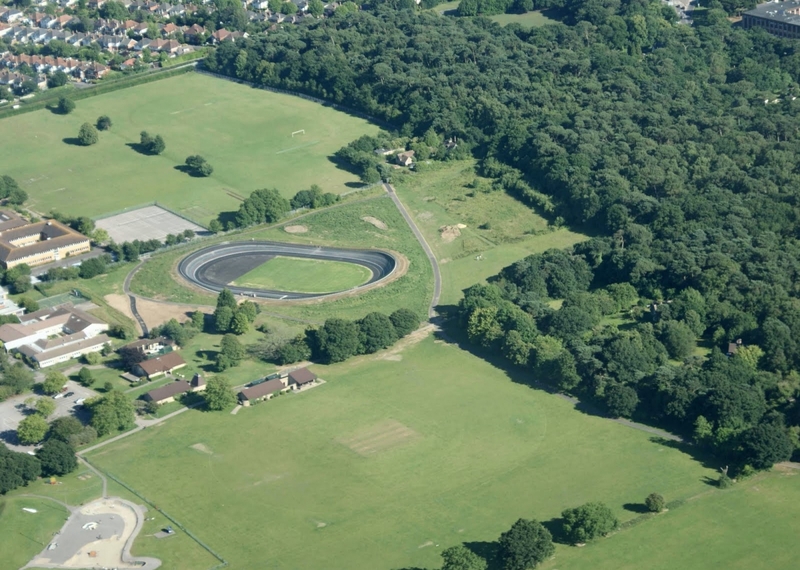 In 2009 a Cycle track / Velodrome was proposed for the area. In response to this a small group of residents put in an application to declare Slades Farm a village green; this application failed. 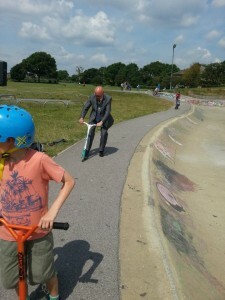 In 2011, with funding from British Cycling and a grant from Bournemouth Borough Council, the 250 metre Cycle Track / Velodrome was built at a cost of £800,000; this is now known as Bournemouth Cycling Centre. 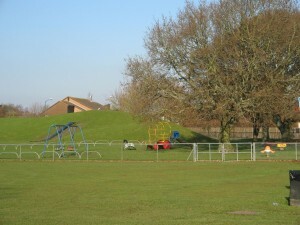 In 2012, the remaining items of play equipment next to the skate park were removed and a new play area was built to the rear of the changing rooms. 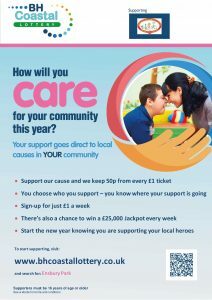 This was funded by Bournemouth Borough Council and a grant from the Primary Care Trust at a cost of £50,000. 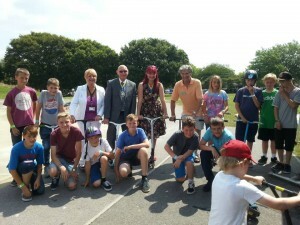 Also in this year, a community garden project was begun on land between the Dog Exercise Park (also an addition in 2012 that features many items of equipment for the purpose of exercising dogs in a fenced environment) and Talbot Woods by a local community group in conjunction with the council. 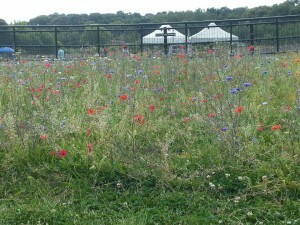 The aim of the project is to grow environmentally sustainable produce.